Lions are tawny brown with lean bodies. Males are distinguished by their mane. The mane is very light when the males are still young and darkens with age. Retractable claws stay sharp while walking and are extremely lethal when hunting and running. Fur is uniformly black in color except for a tan muzzle and sometimes light markings on the chest. They are smaller than grizzly bears and have smaller claws that are more tightly curved, and longer, smoother, and more tapered ears. Weight averages between 150-300 pounds. They are generally uniform brown, and sometimes lighter almost beige. The horns which males and females possess are thick and have numerous fine rings although in older animals these may be worn down. Horns in males can be up to 33 inches in length. Tigers are the largest cats in the world, and Bengal Tigers are second largest, weighing between 350 to 580 pounds. Their coat is reddish orange with black, white, and sometimes brown stripes which help them hide in the shadows of tall grasses while hunting. Bison are the largest land mammal in the western hemisphere. These huge animals weigh up to 2,000 pounds. They have very thick fur to help protect them from the harsh winter in northern America. They use their skulls as a battering ram when fighting predators or for mates. Although the black-footed ferret was once the most endangered mammal in North America, conservation efforts have brought this tiny, tenacious predator back from the brink of extinction. Spider monkeys get their name from the spider like appearance when they move through the trees. They use their prehensile tail as a 5th limb. Black handed spider monkeys are smaller in size only weighing 15-20 pounds. The bobcat is a stout-bodied, medium-sized feline, with a short "bobbed" tail, a prominent face ruff and tufts of black hair on its pointed ears. The tail may have one to several indistinct dark bands and a tip that is black on top and whitish below. Boer goats are a stocky breed of domesticated goats that originated in South Africa as herd goats. They are usually white in body and they have a reddish brown head. 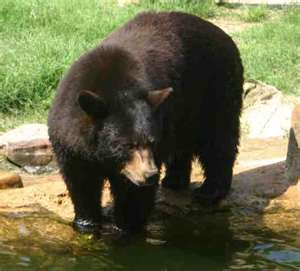 They can weigh up to 300 pounds and are known for having inquisitive personalities. This squirrel sized rodent is best known for its soft fur. Chinchillas were hunted to near extinction in the wild for the production of chinchilla fur products. They have 4 toes on each of their feet. Their ears are big and round and are somewhat similar to a rabbit. When found in the wild, normal coloration is grayish with black and brown and sometimes red sprinkled throughout but their color can vary as much as a domestic cat. They can weigh anywhere from 2.2 lbs to 15.4 lbs. 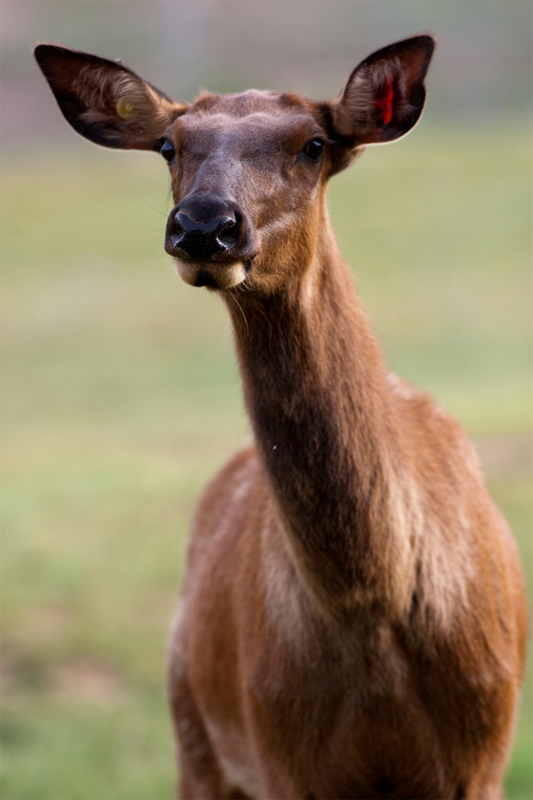 Elk are large mammals that resemble moose and deer. A bull elk can have antlers that reach 4 feet over their head, making them a towering 9 feet tall. The cows do not have antlers and are generally slightly smaller than the bulls. The grey fox is peppery gray on top, reddish-brown on its sides, chest and the back of its head. Its legs and feet are also a reddish color. It has a long bushy tail with a black stripe on top. The grey fox has pointed ears, a pointed muzzle and long hooked claws. Miniature donkeys range in size from 26-36 inches at the withers. They are extremely intelligent, docile and easily trained. 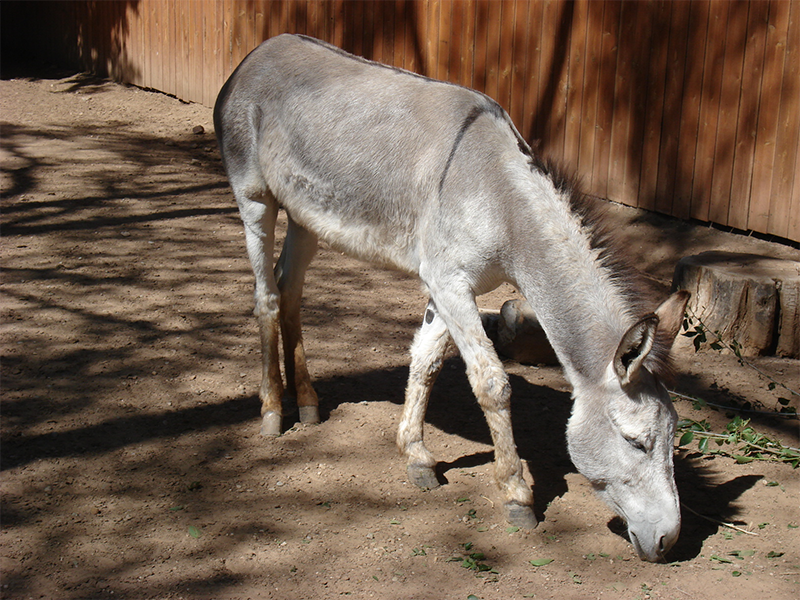 Donkeys have developed very loud vocalizations. The best-known is referred to as a "bray" and can be heard for over three miles. Miniature horses originated in Europe and were bred as pets for the children of nobility. They were also used in coal mines to pull ore cars. Developed from multiple sources, miniature horses were bred from many different pony breeds. Mouflon are medium-sized sheep with adult males averaging about 120 pounds. They have a coarse, heavy coat that hides a woolly under fur in the winter. They are usually red-brown with a dark back-stripe, light colored saddle patch and under parts. A mustang is a free-roaming feral horse of the North American west that first descended from horses brought to the Americas by the Spanish. Mustangs are often referred to as wild horses but the more correct term is feral. 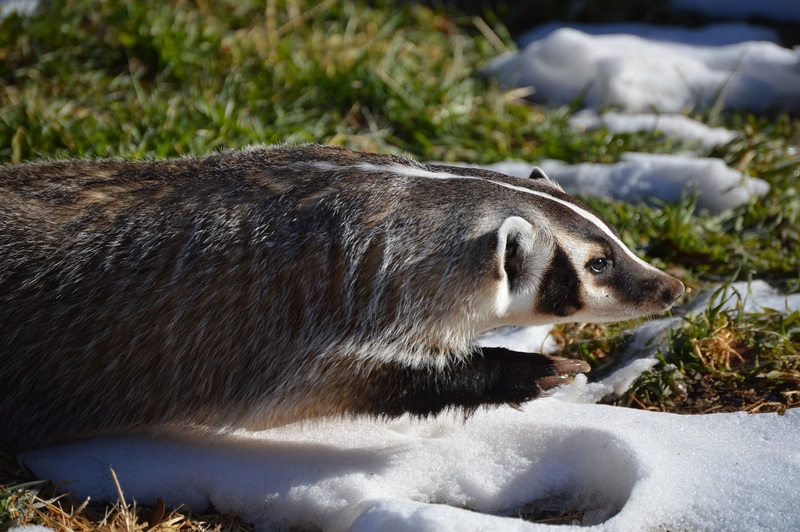 The North American badger is a stout, stocky member of the weasel family. With long, sharp claws for digging and a flat, compact body, badgers are well suited for burrow construction- they'll dig their own or use the burrows of other animals. There are over 60 species of opossum with the Virginia opossum or common opossum being the one found in the United States. They are the only marsupial to live in the Unites States or Canada. They can grow to be about 2.5 ft long and weigh up to 13 pounds. Slender, graceful, deer-like body. It has large, protruding eyes and a white or buff, 4-inch tail. The upper body and outside of the legs are tan to brown. The cheeks, lower jaw, chest, belly, inner legs and rump are usually white. Their horns are hollow sheaths over a bony core. Red Kangaroos are the largest marsupial. They can tower over 6 feet tall and weigh up to 200 pounds. The females have pouches that they carry their young in, or joeys. Their hind legs cannot move independently, so they use their front feet for stability. Ring-tailed Lemurs are appropriately named for their ringed tails. They are primitive primates that are small in size, only about two and a half feet in length. Like a lot of primates they have opposable thumbs and use these to grab things. One of seven small species of African wildcats. The serval generally weighs between 30-40 pounds and reaches 22 inches in height. Their spotted coat resembles the larger cheetah and aids in camouflage. The serval's long legs and neck aid it in seeking prey in tall grasslands. Striped Skunks are small mammals in the weasel family. They are about the size of a house cat and have long fur. They have long dull claws that are used for digging and turning over logs for food, and sharp teeth to help them eat the meat they catch. 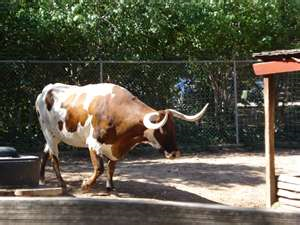 The Texas longhorn is a breed of cattle known for its characteristic horns which can extend to 120 inches tip to tip for steers and exceptional cows and bulls in the 70 to 80 inch tip to tip range. They originate from Spain.